Celebrate the holiday season right here in Bloomington/Normal at the following events! With Thanksgiving activities coming to an end, it’s officially time for almost everyone’s favorite time of the year – the Christmas season! Radios have started playing famous Christmas tunes we all know and love and holiday lights are shining bright. While everyone is getting into the Christmas spirit, we would like to highlight some of the events that are taking place in and around Bloomington-Normal this year. Our hope is to give you and your family some options for holiday fun and maybe even to provide ideas for new holiday traditions! 1. Once Upon a Holiday: Friday December 2nd from 5:00 pm – 8:00 pm in either Downtown Bloomington or the McLean County Museum of History. You can enjoy music, refreshments and live window vignettes. 2. 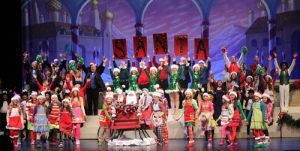 The Pantagraph’s Holiday Spectacular runs Friday December 2nd at 7:30 pm through Sunday December 4th. 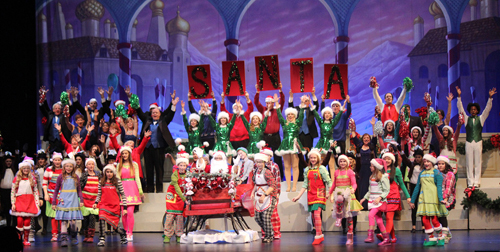 Saturday and Sunday performances are at 2:00 pm. 3. Wild Lights: at Miller Park Zoo runs from Friday December 2nd through Sunday December 4th at 5:30 pm – 8:00 pm. Witness hundreds of luminarias around the zoo. This is not a free event, admission is $3 per person for zoo members or $7 per person for non-members. 4. Skate with Santa: at the Pepsi Ice Center on Saturday December 3rd from 12:40 pm – 1:55 pm. Free cookie and hot chocolate with paid admission! Santa will be available for pictures. Admission is $6 and skate rental is $2. 5. Santa’s Station Opening day in Uptown Normal is on Saturday December 3rd. This will run through Sunday December 25th and is open from 1:00 pm – 5:00 pm. Santa’s station is located between Uptown Station and the Children’s Discovery Museum. 6. The Gridley Christkindl Market is Friday December 9th – Saturday December 10th from 4:00 pm -8:00 pm. 7. Breakfast with Santa at Miller Park Zoo on Saturday December 10th at 8:30 and 10:00 am and “Can Reindeer Fly” at the zoo on Sunday December 11th at 2:00 pm. 8. Away in the Basement: A Church Basement Ladies Christmas on Tuesday December 13th from 2:00 pm -4:00 pm and 7:30 pm – 9:30 pm. 9. Tour De Lights is a holiday lights tour at the Lincoln Leisure Center on Wednesday December 14th from 6:00 pm – 7:30 pm. Travel around town to see the lights! Snacks are provided. 10. Artists Lounge Live: The 12 Dames of Christmas Starring Angela Ingersoll on Thursday December 15th at 7:30 pm. Enjoy the live concert and listen to some of the holiday favorites. 11. Charles Dickens’ A Christmas Carol presented at the Bloomington Center for the Performing Arts on Sunday December 18th at 2:00 pm. 12. Here Comes Santa Claus: at the Normal Public Library. This is on Monday December 19th from .6:00 pm – 7:30 pm and Tuesday December 20th from 10:00 am – 11:30 am. Come meet Santa, enjoy a story, sing Christmas songs and make a craft! BN Realty would like to be the first to wish you and your family a very Merry Christmas and a happy holiday season! We hope to see you at an event or two – and as always, we want to let you know that we appreciate your business! Please keep us in mind when you see a beautifully decorated home that happens to have a for sale sign in its front yard.